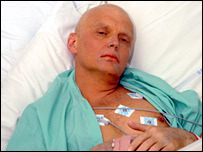 Tests are to be carried out on people who may have come into contact with Russian ex-spy Alexander Litvinenko. His death has been linked to the presence of a "major dose" of radioactive polonium-210 in his body. Radioactive traces were found at a London hotel and sushi bar he visited on 1 November. UK civil contingencies committee, Cobra, has met to discuss the case, and Met Police say it is one of the most difficult inquiries they have handled. They say the case is so difficult partly because of the more than two-week gap between the day former KGB agent Litvinenko is thought to have been poisoned and police beginning their investigation on 16 November. They have been examining two meetings Mr Litvinenko had on 1 November - one at the Millennium Hotel with a former KGB agent and another man, and a rendezvous at the Itsu sushi restaurant in London's Piccadilly. Mr Litvinenko fell ill later that day. Anyone who was in the Itsu restaurant, or who was in the Pine Bar of the Millennium Hotel on 1 November has been urged to contact NHS Direct on 0845 4647. An HPA spokeswoman said: "We expect that we are going to do [urine] tests and we expect that they are going to be negative and we have no reason to think customers are at risk." Police have been searching the sushi bar and a bedroom at the Millennium Hotel, but investigations at Itsu are now complete and the premises are being decontaminated. Meanwhile, chief medical officer Sir Liam Donaldson has issued advice to GPs and hospitals on the risks and clinical implications of exposure to Polonium-210. 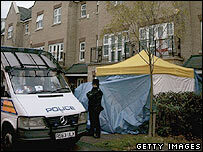 BBC home affairs correspondent Andy Tighe said various sites are regarded as crime scenes. Officers are also interviewing witnesses in an attempt to find out who Mr Litvinenko met around the time he fell ill. CCTV footage is also be scrutinised. Tests are being carried out at the two London hospitals where Mr Litvinenko had been treated, University College and the Barnet General, the Health Protection Agency (HPA) said. "We want to reassure the public that the risk of having been exposed to this substance remains low, the HPA said. "It can only represent a radiation hazard if it is taken into the body - by breathing it in, by taking it into the mouth, or if it gets into a wound. It is not a radiological hazard as long as it remains outside the body." A post-mortem examination on Mr Litvinenko has not yet been held. The delay is believed to be over concerns about the health implications for those present at the examination. 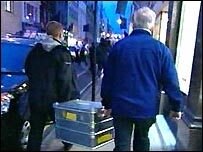 Police searches are taking place at Mr Litvinenko's house in Muswell Hill, north London, where radioactive traces were discovered, and other places he had been. Friends have said Mr Litvinenko was poisoned because of his criticism of Russia. In a statement dictated before he died at University College Hospital on Thursday, the 43-year-old accused Russian President Vladimir Putin of involvement in his death. He was known to be a fierce critic of Mr Putin. Mr Litvinenko had recently been investigating the murder of his friend, Russian journalist Anna Politkovskaya, another critic of the Kremlin. Mr Putin's spokesman Dmitry Peskov reiterated the Kremlin's earlier dismissal of allegations of involvement in the poisoning as "sheer nonsense". Mr Putin himself has said Mr Litvinenko's death was a tragedy, but he saw no "definitive proof" it was a "violent death". Russian newspapers - many of which are controlled by the Kremlin - have also reacted angrily to implications that Moscow was involved in Mr Litvinenko's death. The Foreign Office has passed on a request through the Russian ambassador for authorities in Moscow to make available any details which might help British police with the case.